Although many people have their central heating boiler serviced on a regular basis, they tend to forget about the rest of their heating system. Whilst the central heating boiler is undoubtedly an important part of your heating system, it can only work efficiently if all the other components in your heating system are in good order. Not many people realise that following the boiler, the next most important item in your heating system is the actual water that your system contains. The condition of the water in your system is of paramount importance in ensuring that your heating system works efficiently, not only from a comfort point of view, but also supplies this comfort level in a fuel-efficient manner. A leading water treatment manufacturer states that a highly corroded heating system can be wasting up to thirty five percent of the fuel used. Whilst this figure obviously relates to a worst case scenario, it shows just what impact corrosion can have on the efficiency of your heating system. 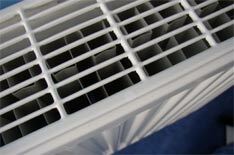 A corroded heating system can also impact heavily upon the comfort levels you attain. Symptoms such as a slow warm up, radiators that heat up unevenly, boiler & system noise, regular bleeding and pump and valve failures can also indicate that your heating system is operating in an inefficient manner. If left unattended to, advanced levels of system corrosion can also cause radiators, pumps, valves and boiler heat exchangers to fail prematurely. Remedying failures on this scale is obviously rather expensive. We can carry out a through test of your system’s water to ensure that corrosion levels are not excessive. This check will enable us to advise you as to whether your heating system has the correct level of inhibitor dosage, the alkalinity and acidity levels in your system and also whether there is a high level of fuel wasting magnetite and lime scale present. We can carry out this test for only £35.00 plus V.A.T. We can also advise on how by simply upgrading one of your system’s controls, you will be able to achieve a more consistent level of warmth in your home whilst actually using up to ten percent less fuel than you are currently using.